Contact Elaine Sheetz, Director of Events at 301-654-8333 for specialized menus, prices and venue overview. 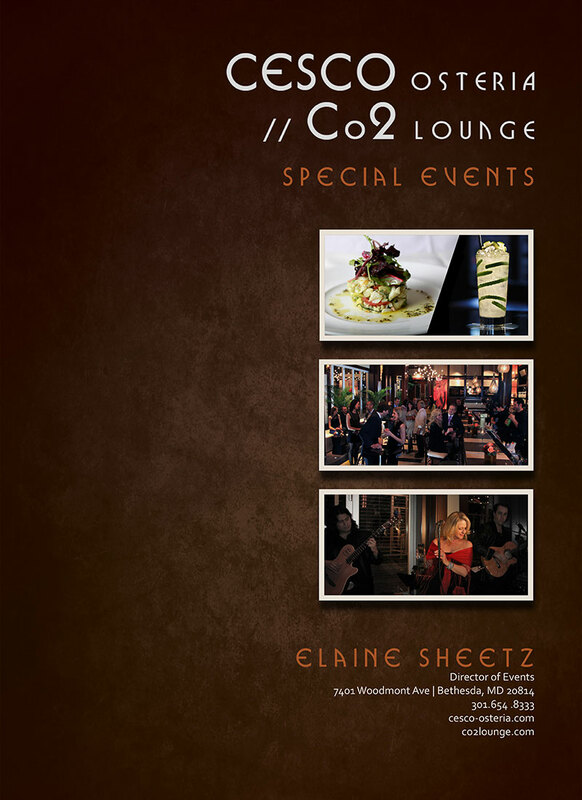 The unparalleled amenities and unique design of CESCO osteria // Co2 Lounge are perfect for special events such as weddings, birthday parties, family and religious celebrations, corporate meetings, political, cultural and charitable events, and cocktail hour and after hours celebrations. The spectacular 10,000 square foot venue can accommodate from 10 to 300 guests inside and an additional 110 on the adjacent Terrazza CESCO for al fresco dining and lounging from March through mid-November. The exclusive Private Dining Room space can accommodate up to 100 guests.